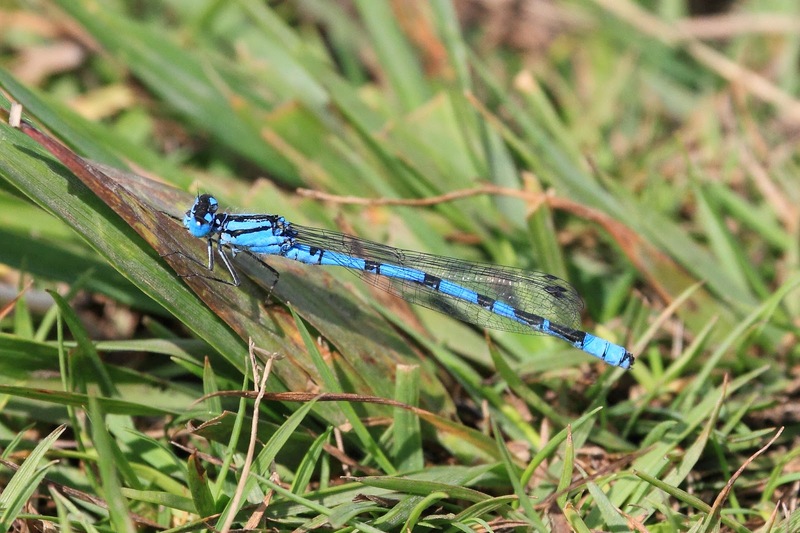 The Common Blue Damselfly was @SpeciesofUK from 27th May to 1st June, 2014. 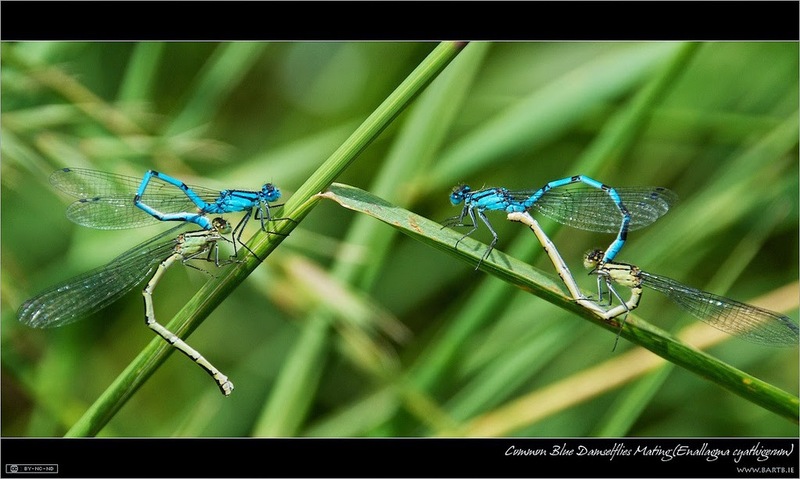 The common blue is a small and brightly coloured damselfly that is common throughout Europe and the British Isles. Damselflies from part of the Odonata order. Dragonflies and damselflies together make up the order of carnivorous insects called Odonata, which contains about 6,000 species worldwide. The characteristics of Odonata species include large heads with well-developed eyes, two pairs of wings that move independently of each other, and elongated abdomens. 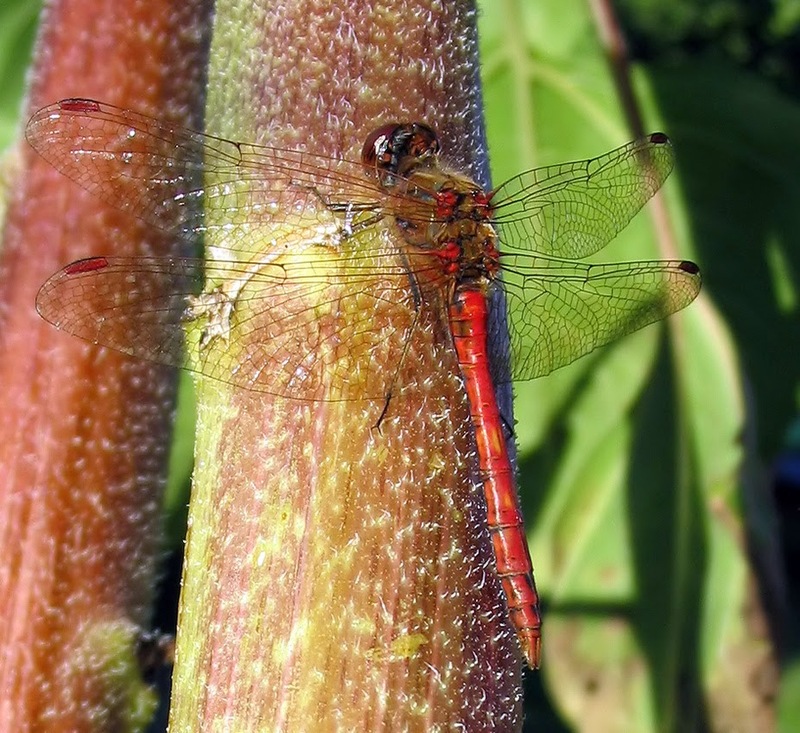 It’s relatively easy to tell dragonflies and damselflies apart. Dragonflies are stronger flyers than damselflies, have more robust bodies, hold their wings out while at rest rather than folded, and have eyes that touch together in the middle. 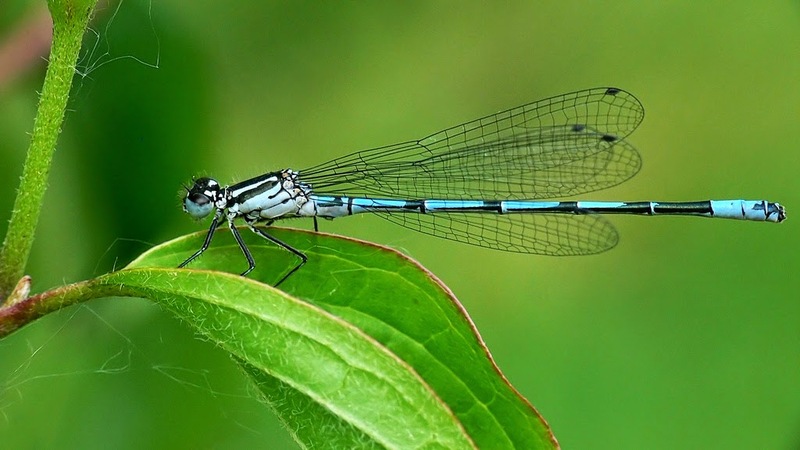 The common blue dragonfly is a member of the Enallagma genus, also known as the 'bluets', within the Coenagrionidae family, the so-called 'pond damselflies’. 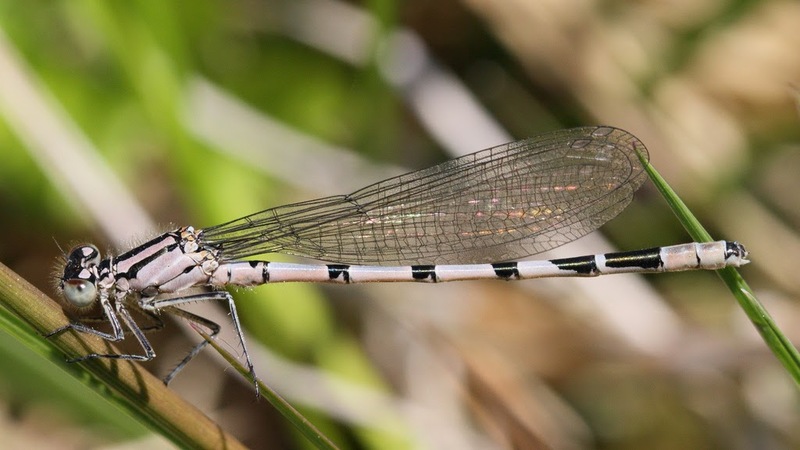 The pond damselflies are the largest damselfly family in the UK and indeed the world, containing the most common and the smallest damselfly species. 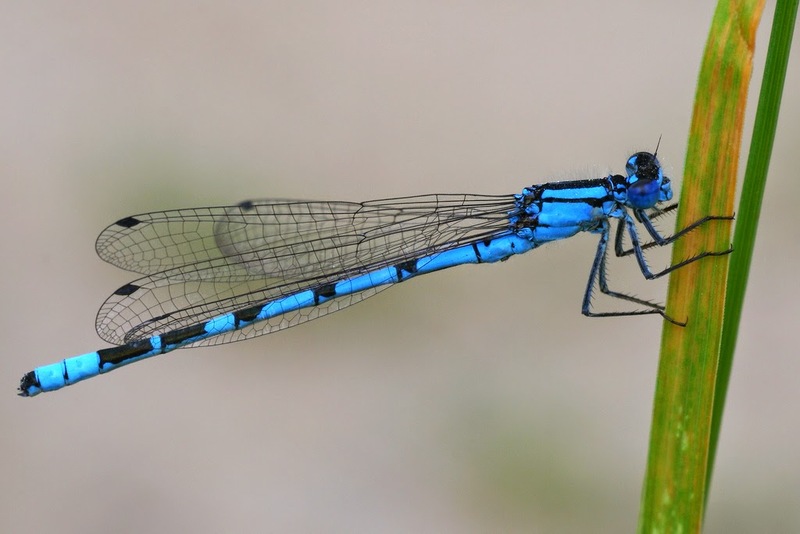 The common blue damselfly is common in Europe and North America. 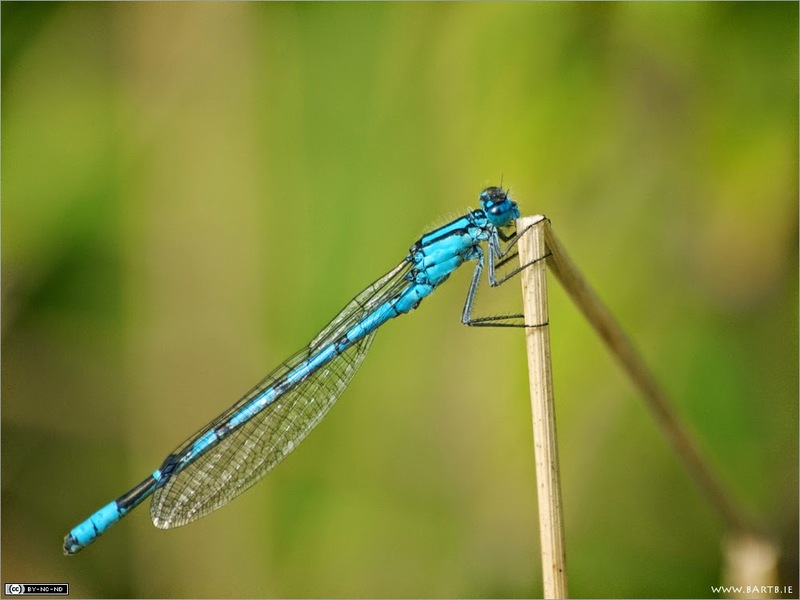 The common blue damselfly is abundant throughout the British Isles and is common throughout all of Europe except Iceland. Unusually, the common blue damselfly can be found in both Europe and North America, its range encircling most of the northern hemisphere. 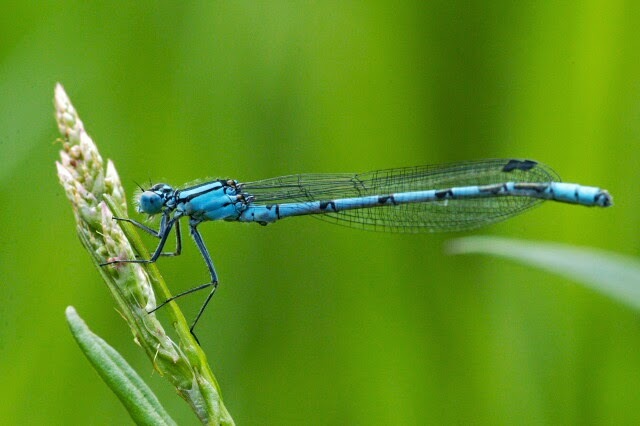 The common blue damselfly occurs in most bodies of water where there is bankside vegetation, especially large lakes and reservoirs. 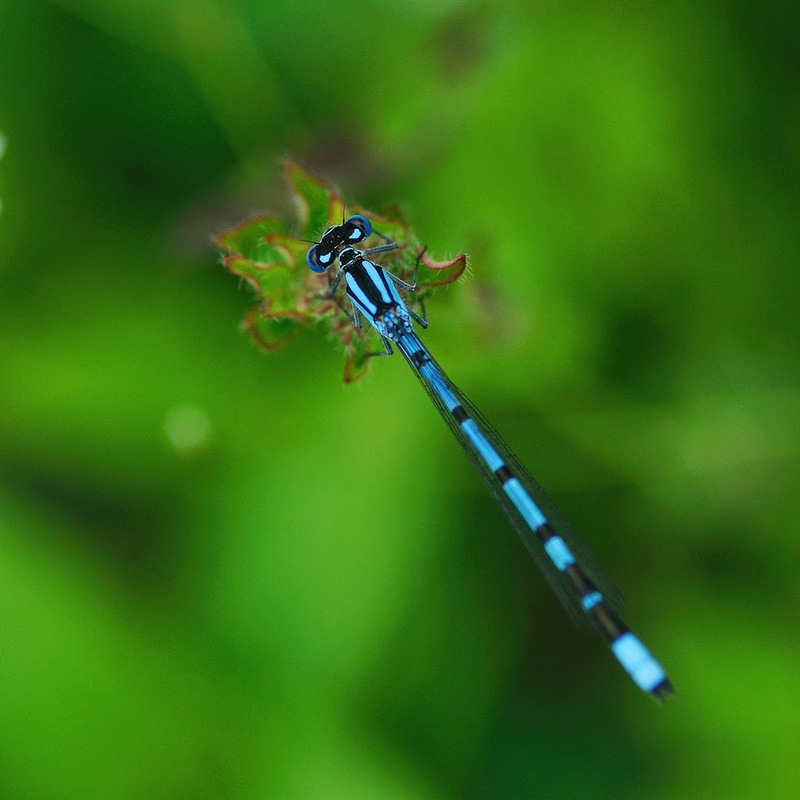 The common blue damselfly is relatively small and brightly coloured. 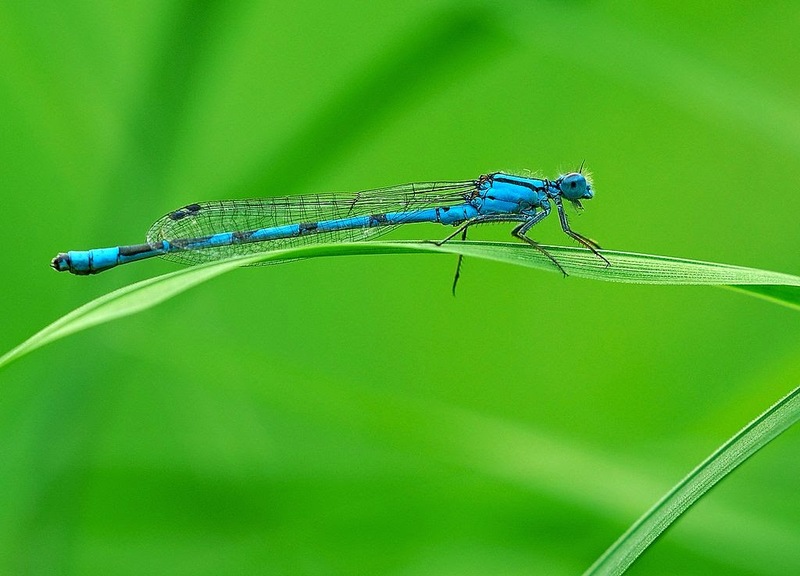 The common blue damselfly reaches about 32-35mm in length with a 38mm wingspan. It is probably the most 'typical' UK damselfly. It mostly shares an attractive, variable blue and black colouration with several other species. 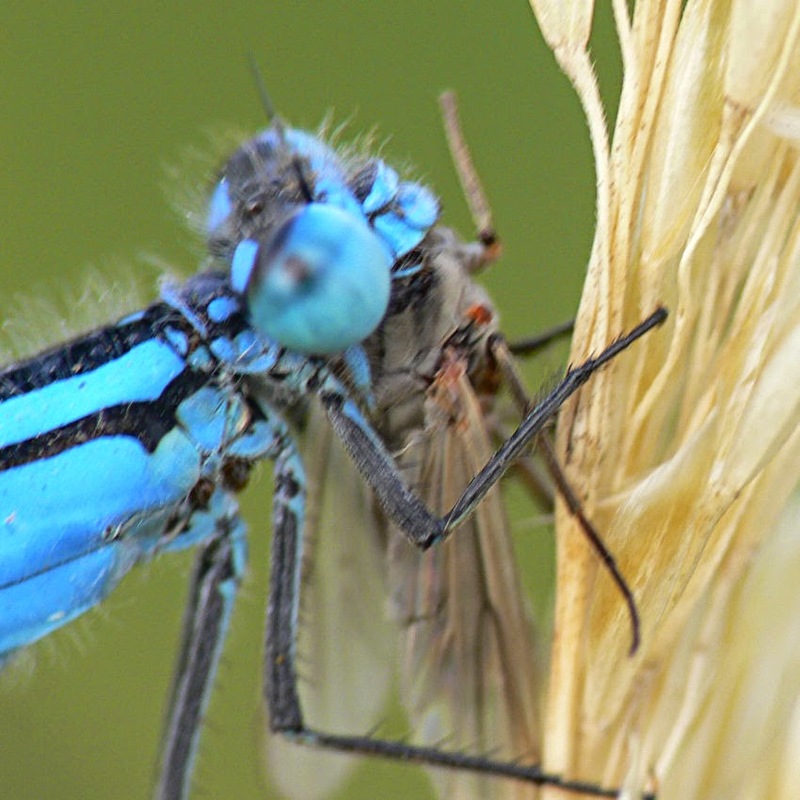 The male common blue damselfly is predominantly blue with black spots that look like stripes. It has a characteristic mark on S2 (segment 2) - a spot linked to the inter-segment suture by a short line. Segments 8 and 9 of the male common blue damselfly are entirely blue. The blue colour is particularly bright compared to other species. The most identifiable mark to look for on the common blue damselfly is on the thorax. 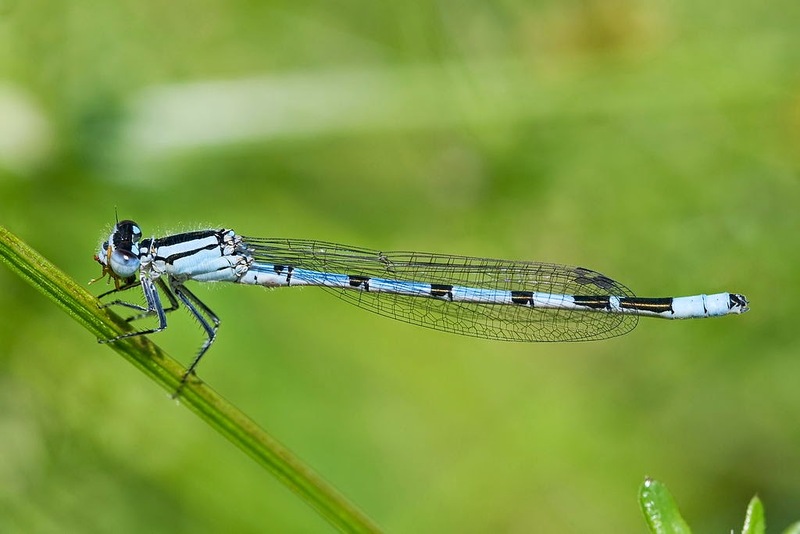 The common blue is the only British blue to have one stripe on its side, whereas others have a second smaller stripe known as the ‘Coenagrion spur’. One species that is similar to the common blue is the azure damselfly, Coenagrion puella. But common blues are noticeably more blue than black while azures are more evenly black and blue. Azures also of course have the spur on the thorax. The common blue's behaviour is also different from the azure. Typically they fly low through the reeds and well out over the water, unlike the azures. 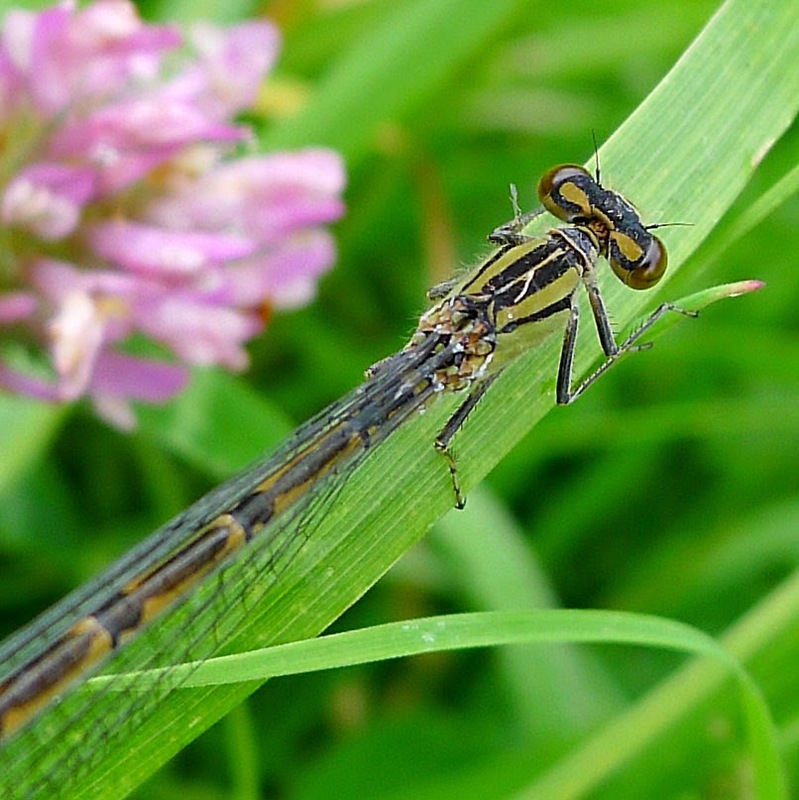 The female common blue damselfly is darker than the male with larger areas of black. Her background colour is usually a dull green, but can be blue like the male. The female common blue damselfly has some distinctive marks of her own - a 'thistle' shape on segment S2 and a 'Christmas tree' stepped triangle on S8. Common blue damselflies appear from May to September. 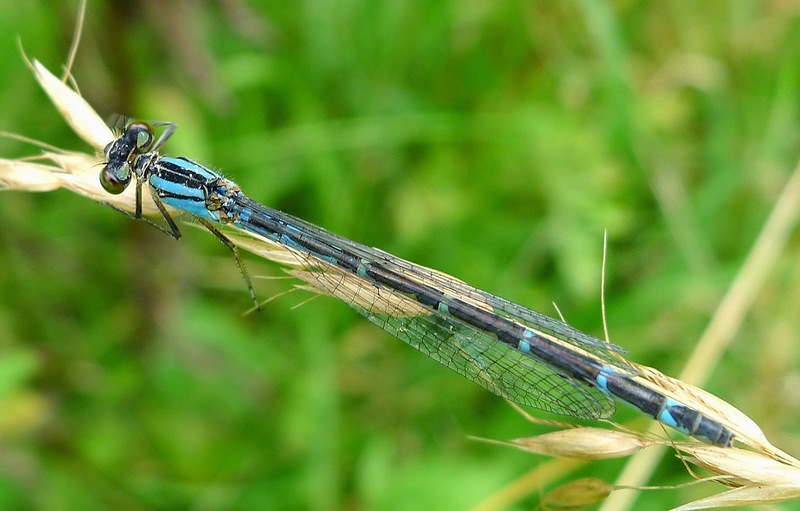 Common blue damselflies appear in mid-late May through to September. Adults only live for about twelve days in which time they must breed. 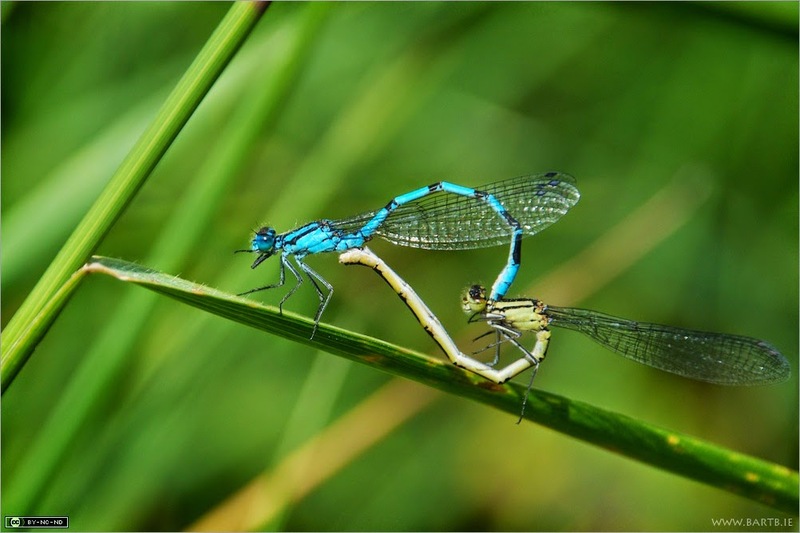 To mate, a male common blue damselfly clasps the female by her neck while she bends her body round to his reproductive organs. This posture is called the common blue damselfly's 'mating wheel’ and can last for twenty minutes. 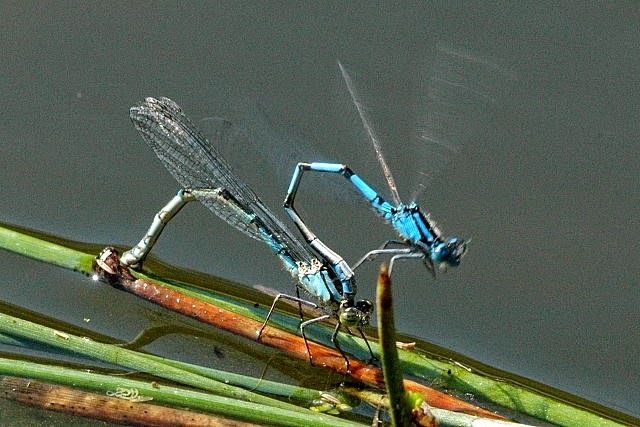 The pair of common blue damselflies then fly together over the water and the female lays eggs in the tissue of a suitable plant just below or just above the surface. 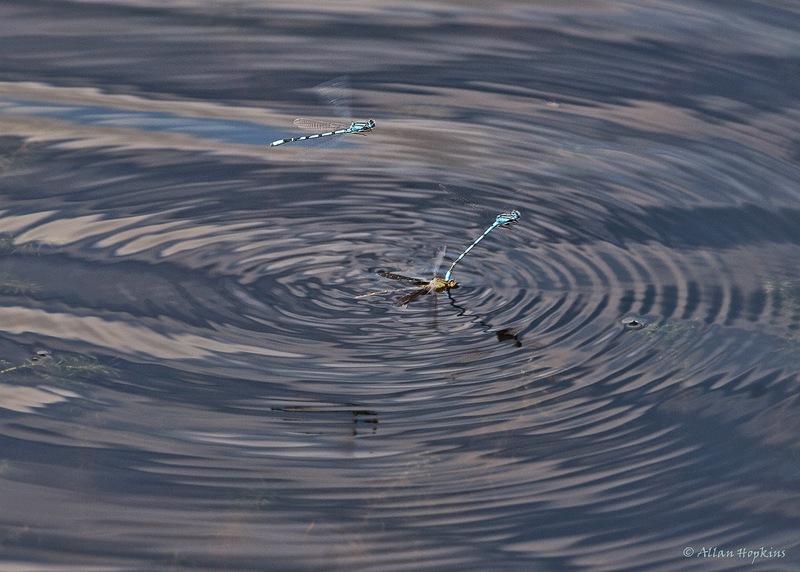 The female common blue damselfly can remain submerged for some time while laying her eggs. The male will stand guard above her, holding her in place. 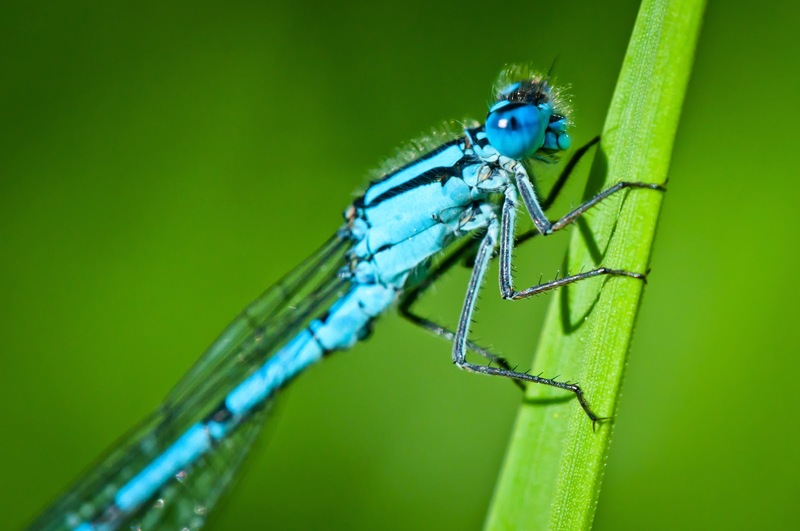 Common blue damselflies spend most of their lives as larvae. When the common blue damselfly's eggs hatch the larvae emerge. These are known as the 'nymphs’. The common blue nymphs live in water and are predatory hunters, feeding on small aquatic animals. Later the common blue nymphs crawl or climb out of the water, up a suitable stem, where they moult into damselflies. Once free of its nymph casing, the adult damselfly arches its body backwards as if stretching after a long sleep. It pumps blood into its wings veins. 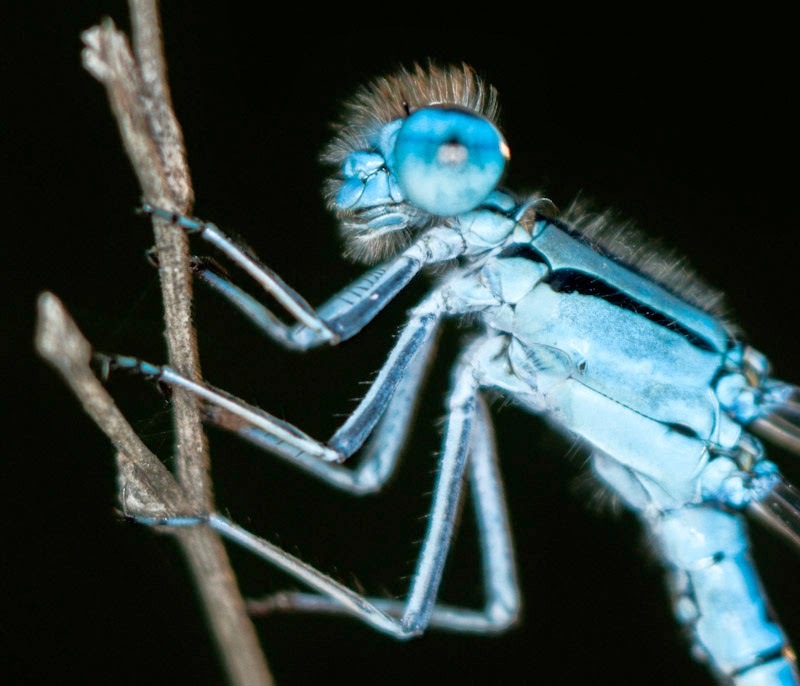 Dragonflies and damselflies are a relic of the insect evolutionary past. They still use the two pairs of membranous wings that all insects started with. In many other insects either the front wings have evolved into wing covers (think beetles) or the hind wings have been lost altogether.